As a physician and wellness practitioner, I meet many people who suffer physical illnesses resulting from living lives that are not fulfilling. They need to make changes, but lack a plan for making lasting change in their lives. What struck me as refreshing about Choose Your Story, Choose Your Life is its rare honesty, so let me be equally honest: if you want to be coddled and told you can get what you want without doing the work that causes that result, this isn’t the book for you. There are many self-help books on the market today that claim to be a remedy for what ails us; lots of discussions about the pressures of the modern world, and all the “tricks” we must learn in order to better cope with it. And then there is Choose Your Story, Choose Your Life—a book that tells you what you need to hear, not just what you want to hear. No more wishing, no more excuses. This deceptively brief “life guide” (my phrase, not the author’s) goes beyond the simple recognition phase of improving one’s life and takes you to the most important step—the one that makes the difference. It shows you how to rethink, rebuild and live the story of the life of your choosing. 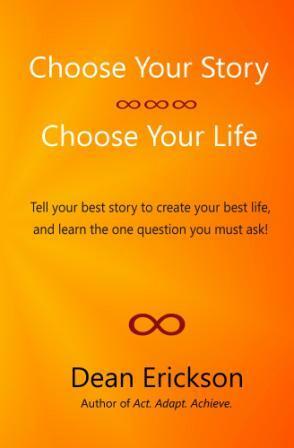 Dean Erickson talks about his book, Choose Your Story, Choose Your Life and discusses how “Choosing Your ‘A’ Story” can help you live your best life and positively impact your personal economy.